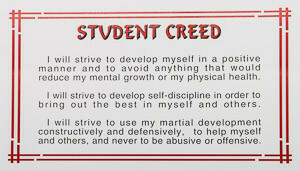 Every class begins with reciting the Student Creed and ends with reciting the Black Belt Principles. WNY Karate Center was awarded the Youth Best Mentor Award by Erie County and is a Certified Martial Arts School for Character Education by the Jefferson Center Sports Division. Every week we discuss with the students in our children’s classes a different character word, such as honesty, respect, perseverance, etc. , at the end of class. We talk about what the word means and how the children should apply it in their everyday lives – with family, friends, teachers and other adults, whether at home, on the playground, at karate, or in school. 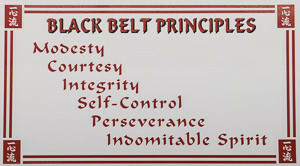 Children are expected to follow the Student Creed and the Black Belt Principles in karate class and in their daily lives. Eat good foods and make healthy choices. Do what is right, even when no one is watching and even if they don’t want to. Never hurt other people either physically or with words. Do not fool around with their Martial Arts skills, or use techniques on siblings and friends. Use karate skills only when someone tries to hurt you or take you away. We strongly encourage our children to bring in their report card each marking period. Sensei Jim will take the time to personally go over the report card with the child. Children are taught the importance of doing well in school. Many teachers have told us how much their students have improved in school – focus, concentration, better listening, higher grades – as a result of their karate training at Western New York Karate Center.